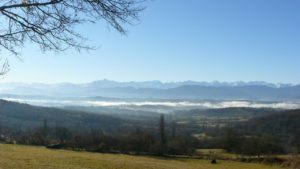 This could equally be describing the Ariège region and, indeed, what many buyers are looking for when they buy property here which explains why the region is becoming more and more sought-after in this uncertain post Brexit, post Trump, divided and uncertain world. By a wonderful freak of nature, the Ariège region happens to be set in an area of glorious, unspoiled and outstanding natural beauty, much of it national park with the Pyrénées providing a stunning backdrop. It has a great climate, plenty of sunshine and rainfall with both forests and fertile soil with fantastic food and wine, much of it organic. All of which provides the ideal conditions for getting away from everything and for living ‘the good life’. This area feels protected and authentic with traditional values and an abundance of mutual tolerance for different people from various backgrounds and origins; a very strong ‘live-and-let-live’ attitude. There are plenty of opportunities for living off-grid and, breathtaking scenery in abundance along with affordable property – you don’t need to be a billionaire to live here. In addition, the great advantage that the Ariège has over New Zealand of course is that it is much more accessible from just about everywhere. « Is a ‘buy-to-let’ property a good investment in France?